Oral history interviews add dimension to the historical record by preserving first-hand recollections of those who may not have initiated historic events, but whose experiences shaped and in turn were defined by those events. Since the 1880s, when interviews were recorded by hand, the Montana Historical Society has conducted oral history interviews with Montanans from across the state, and from various walks of life. Its oral history collection covers such topics as the New Deal and Fort Peck Dam, reminiscences by veterans, war brides, and homesteaders, as well as the history of medicine, education and government in Montana. The projects described below contain relevant interviews with Montana women, discussing their work, activism, and experiences. The links below each project direct researchers to lists with detailed descriptions of individual women’s interviews. Information on how to order copies of transcripts, cassette tapes, or CDs/DVDs can be found here. This bibliography includes oral histories from the Montana Historical Society’s 20th Century Montana Military Veterans Oral History Project. From World War I through the Persian Gulf War, Montana has ranked in the highest percentile nationally in the number of its citizens serving as military personnel. These numbers include nearly 5,000 women since 1940 and a majority of male Montanan tribal members. Montana played a significant role in American military strategies during the Cold War, due to the presence of Malmstrom Air Force Base and its numerous missile silos. This project records the experiences of Montana’s veterans, with discussions of families, precombat training, service on the home front and overseas, returning to civilian life, career military life, and feelings about military conflicts. Number of women interviewed for this project: 19. This bibliography includes oral histories from the Montana Historical Society’s General Oral History Collection. Subjects include: education, emigration, immigration, paid work, unpaid work, child-rearing. Dates variable. Where possible, audio format is noted. The collection is divided between oral histories which have been transcribed and those which have not. Where possible, length of typed transcription is noted. Number of women interviewed for this project: 166. 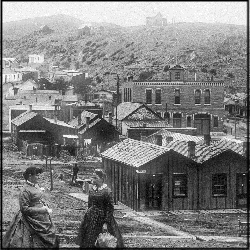 Two women chat at the end of Cutler Street in Helena, c. 1885. Photo Credit: MHS 954-187. Begun in 1896, this ongoing project focuses on the development of Helena businesses from World War I through urban renewal in the 1960s. Montana Historical Society staff and volunteers interviewed people who established or worked in Helena’s communications, entertainment, manufacturing, service, grocery, and retail business. Narrator discussions include business practices, changing consumer demands, changing technologies, and the impact of the automobile. The project not only reflects changes in the economy of the “Capital City” but also sheds light on the fiscal development of towns across Montana and the West. Number of women interviewed for this project: 6. The primary goal of this project was to document the experiences of longtime physicians, nurses, nurse educators, emergency medical technicians and lay health care providers in serving the medical needs of Montanans in the twentieth century. Interviewees discuss the impact of weather, distance, and road conditions on treatment; the role new technologies, drugs, and regulations played in expanding services; recruitment of health care professionals to the state; nursing education opportunities in Montana and the region; and home care remedies and treatments prior to modern medicine. Number of women interviewed for this project: 34. This project examined the metals manufacturing industry and the four Montana communities most directly affected by that industry Anaconda, Black Eagle, Columbia Falls, and East Helena. Members of these communities shared their experiences as merchants, bartenders, union organizers, and families of smelter workers living in towns dominated by metals manufacturing plants. The project was the first in a series designed to explore Montana’s industrial heritage and the role of industry in shaping community identity. Number of women interviewed for this project: 35. This project features interviews from the Choteau region of Montana, Turtle Mountain, and Box Elder. Many of the Métis—members of a culture born of the fur trade—remember the discrimination they faced, going to boarding schools, and the agriculture of the region. Several discuss Métis cultural practices, recipes, and folk tales. Number of women interviewed for this project: 18. Subjects range from women in politics to weddings. Number of women interviewed for this project: 18. This oral history project focused on the experiences of 20 women who came to Montana as the result of marriage to a U.S. soldier during World War II or the Korean War. Interviewees recall life in their home countries, including Australia, England, France, Germany, Korea, Poland, and Wales, and the adjustments that they had to make when they became Montanans. The interviews were conducted between 2001 and 2003. The interviewer was Professor Seena Kohl, Professor of Behavioral and Social Sciences Professor at Webster University in Saint Louis. Dr. Kohl conducted the interviews as a volunteer for the Montana Historical Society, supported with staff development funds from Webster University and a gift from the Friends of the Montana Historical Society. Number of women interviewed for this project: 19. 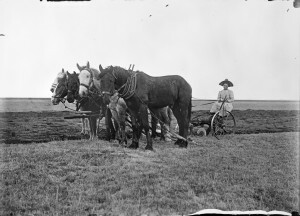 Evelyn Cameron snapped this picture of a woman and her team of five horses at work. Photo Credit: MHS 13-14 PAc 90-87 65-6. Statewide in scope, this oral history project was the first implemented by the Montana Historical Society. Nearly 400 interviews were conducted with Montanans who lived and worked in the state from 1910 to 1945. The project focused on three major occupational areas that dominated Montana’s economy during this period: mining, agriculture, and forest products. 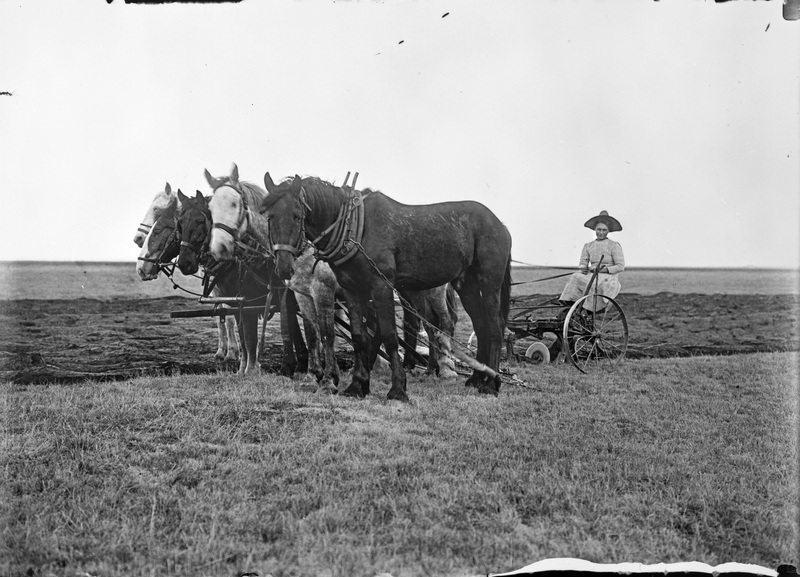 Interviews conducted with people in auxiliary occupations-including merchants, logging camp cooks, teachers, cattle buyers, and railroad workers—augment the recollections of sheepherders, ranch wives, miners, and sawyers. This collection reveals the interplay between livelihood and family life, the formation of public and private identities, and the impact of occupation on definitions of community. Number of women interviewed for this project: 157. Cosponsored by the Office of Public Instruction and the Montana advisory Council on Indian Education, this project recorded the reminiscences of those active in Native American education, both on and off the reservations, from the early twentieth century through the 1980s. Interviewees discuss the boarding school system, the challenges of higher education, theories of teaching, and the development of Native American educational programs across the state. Number of women interviewed for this project: 8. This oral history project documented the economic recovery programs initiated by President Franklin D. Roosevelt in the 1930s and 1940s. These Depression-era programs—including the Work Projects Administration (WPA), Civilian Conservation Corps (CCC), and the Resettlement Administration—played a significant role in the state of Montana, which was listed as second in per capita receipt of New Deal dollars during the Depression. A large portion of the interviews focused on the lives of the workers involved in the Fort Peck Dam project, including cultural and social life in the area. The interviewees include people involved in agricultural programs, commerce, cultural development, Native American culture, labor, work projects, or state and county government. Number of women interviewed for this project: 36. This project explored the history and development of 12 Montana communities: Broadus, Chinook, Choteau, Columbia Falls, Cut Bank, Eureka, Forsyth, Phillipsburg, Plains, Plentywood, Roundup, and Sidney. Ranging in population from 800 to 4,500, these towns reflect the diversity of Montana’s smaller communities and the people and industries that help them thrive. Topics discussed include the role of local institutions, industry community development programs, celebrations, education, religion, and health care in small town life. Number of women interviewed for this project: 112. 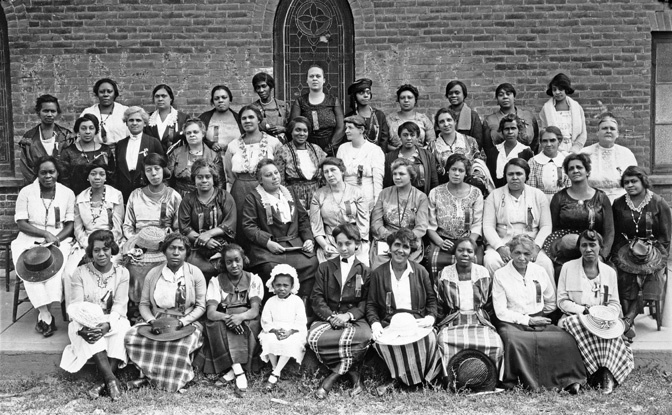 A group of Montana women historians conducted interviews discussing the development and impact of women’s organizations in Montana. Women’s groups often established a community’s first library, school, museum, symphony, or recreational park, so their stories are of vital interest to anyone studying the development of a given town. Interviewees discuss the importance of lodges, church groups, professional associations, and ethnic clubs in fostering women’s involvement in community building. They also discuss the reasons groups flourished at certain times and floundered at others; the differences among autonomous, auxiliary, and coed organizations; and specific goals, issues, and projects tackled by various women’s groups. Number of women interviewed for this project: 45.